Today, one of my all-time favorites was inducted into the Pro Football Hall of Fame. 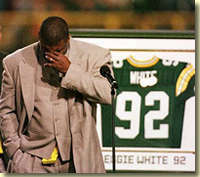 Reggie White, the Minister of Defense. The man who set the trend of Green Bay being a place that it was ok for free agents to go to. The man who was an integral part of the win in Super Bowl XXXI, one of the happiest days of my life. I still can't believe he's gone. When my girlfriend woke me up with a call to my cell to tell me that he was dead, I thought she had to hav e made a mistake. He signed in the days before I could check espn.com roughly 217 times a day, so I didn't find out about the signing until one of my classmates informed me of it the next day. My immediate reaction was simply, "Holy crap! We got Reggie White???" The memories are still vivid, dating back to the days of him being an absolute terror to play against in Tecmo Bowl: Helping hold Barry Sanders to -1 yard in a playoff game, his miraculous recovery from an arm injury that was supposed to leave him on the sidelines for the rest of the year, running at the Dallas bench to cuss them out for calling a timeout so they could kick an unnecessary field goal, the Super Bowl record 3 sacks killing any hope of a Patriots comeback, and of course the image of him running off the field with the Super Bowl trophy which meant so much to him (and Packer fans everywhere). Congrats, Reggie. Thank you for six great seasons and for giving me one of the happiest moments of my life. May you rest in peace. You won't be forgotten. but let's not forget the racism and rampant self-righteousness, present WAY before his ridiculous, embarrassing appearances after his retirement.